Factors of any number should be prime numbers in prime factorization. Factors are numbers which are multiplied to get original number. 2 * 3 = 6 => 2, 3 are factors of 6. They are also prime factors of 6. 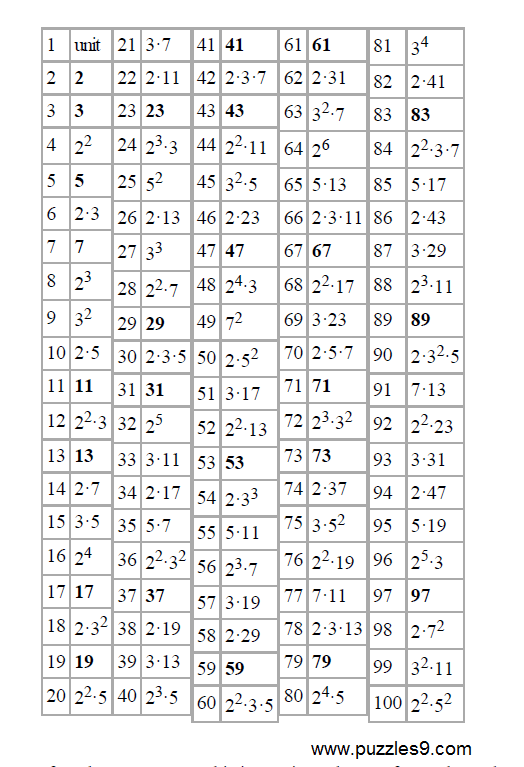 54 = 9 * 6 => 9,6 are factors of 54, but they are not prime factors. Factor Tree can be used to get prime factors of a number. 2 * 3 * 3 * 3 = 54 => this is how we do prime factorization. (2* (3^3)) are prime factors of 54. 25 prime numbers are there in between 1 and 100. First arrange numbers in a table like shown in figure. 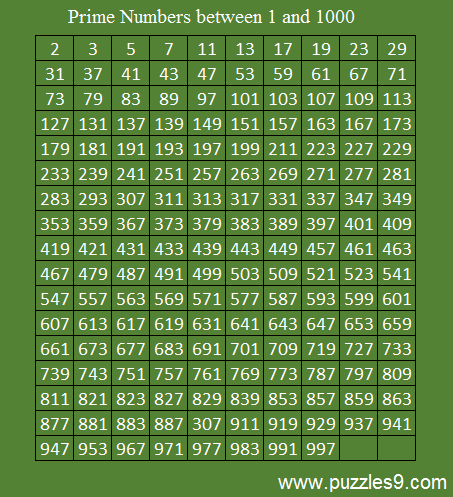 Enter 6 numbers in each row until the last number (in this it is 100) reaches. First we select a number and we strike off all the numbers divisible by that number. Start with 2 which is greater than 1. Round off number 2 and strike off entire column until the end. Similarly strike off 4th column and 6th column as they are divisible by 2. Now round off next number 3 and strike off entire column until end. 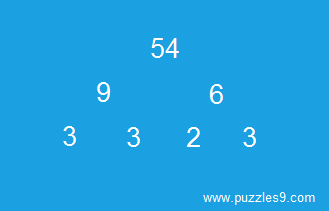 Now round off next number 5 and strike off numbers in inclined fashion as shown in figure (they are divisible by 5). When striking off ends in some row, start again striking off with number in another end which is divisible by 5. new striking off line should be parallel to previous strike off line as shown in figure. Now round off number 7 and strike off numbers as we did in case of number 5. Stop at this point. Wonder why do we need to stop?? This technique was developed in 3rd century B.C. Divide the given number with every number below it. Check whether the given number is divisible by any of the numbers below it except 1. If it is not divisible by any number then it is prime number. “Divisible by” means when you divide the whole number with another whole number result should be whole number with remainder zero. Actually you don’t need to divide with all numbers. First check whether it is divisible by 2 or not. Next check with 3, 5, 7, 11,13….. Check divisibility only with prime numbers. Here also you don’t need to divide with all prime numbers below it. Let p be the given number. 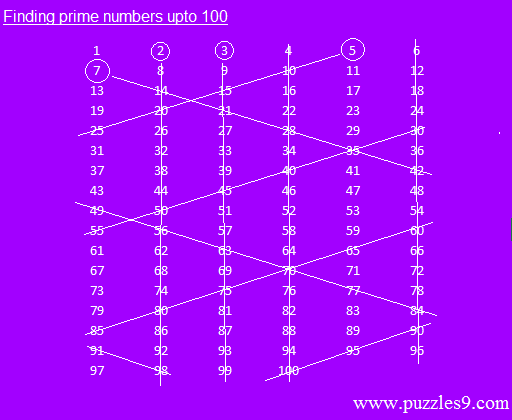 Find prime numbers below n and divide p with only those prime numbers below n.Actually, we used the same procedure in the above figure of finding all prime numbers upto 100. Let us find whether 149 is prime or not. [square root of 149= 12.20 < 13] prime numbers below 13 are 2,3,5,7,11…. 149 is not exactly divisible by 2, because it don’t has even number at end. 149 is not exactly divisible by 3, because the sum of numbers 1+4+9= 14 is not divisible by 3. 149 is not exactly divisible by 5, because it don’t has 0 or 5 at end. 149 is not exactly divisible by 7,11. 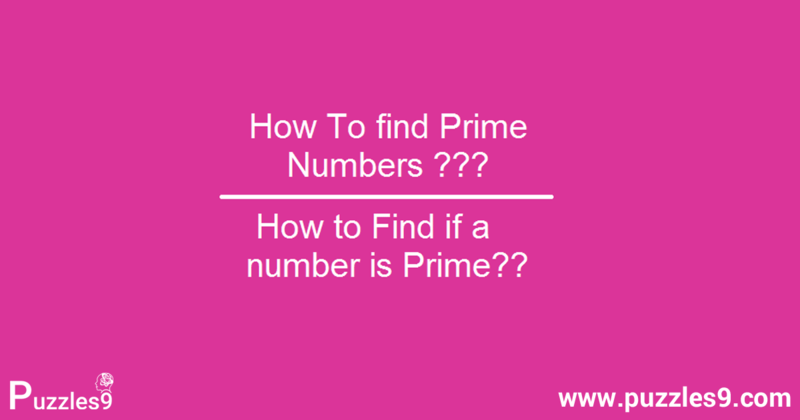 Let us find whether 631 is prime or not. [square root of 631= 25.11 < 26] prime numbers below 26 are 2,3,5,7,11,13,17,19,23…. So, 631 is prime number…For easy divisibility checking, you should know the divisibility rules. H.C.F. of two numbers in one set should be 1.
b are co primes, then N is divisible by ab. Difference between prime numbers in one set should be 2. 2 is the only one prime even number. Numbers greater than 1 and which are non prime numbers are composite numbers. Some probabilistic methods are available for checking big prime numbers. Here is the list of prime numbers upto 1000 for your reference. Thats all about Prime Numbers.